Daylight saving time (DST) is the practice of advancing clocks during the lighter months so that evenings have more daylight and mornings have less. Typically clocks are adjusted forward one hour near the start of spring and are adjusted backward in autumn. The modern idea of daylight saving was first proposed in 1895 by George Vernon Hudson and it was first implemented during the First World War. Many countries have used it at various times since then. Much of the United States used DST in the 1950s and 1960s, and DST use expanded following the 1970s energy crisis and has been widely used in North America and Europe since then. 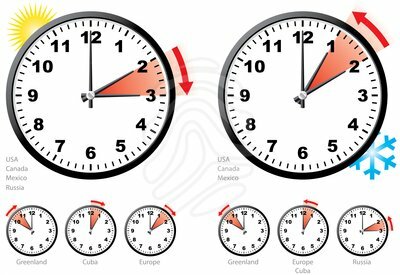 DST clock shifts present other challenges. They complicate timekeeping, and can disrupt meetings, travel, billing, record keeping, medical devices, heavy equipment, and sleep patterns. Software can often adjust computer clocks automatically, but this can be limited and error-prone, particularly when DST dates are changed. As of now every electronic device programmed as such the time changes according to DST. Tunisia In 2009 the government of Tunisia canceled DST and kept the standard time all year round. End: Last Sunday of October. Practiced in 2009. Not currently observed.